Welcome to our cheery Sundial Cottage! Loaded with extras and catching all the sea breezes, we're a short stroll from the beautiful sugar white beaches. 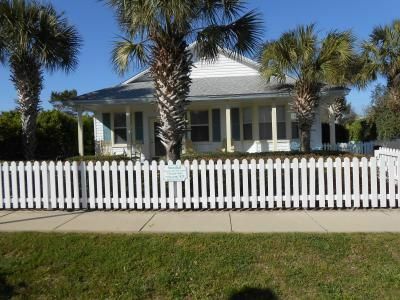 It's nestled in the adorable Crystal Beach area known for its white picket fences, pastel color houses with beautiful landscapes, privacy, and relaxation! The location is outstanding--within walking distance to the beach, restaurants, and shopping and a short drive to everything! The house is so spacious, it beems with Florida's sunshine--we call it the happy house!! Perfect for relaxing by the private pool or beach or within minutes to all the action Destin has to offer! If this is your first trip to Destin you are in for a wonderful surprise ! Boat rentals and wave runner rentals within a short drive. Several great golf courses within a short drive. Private pool in landscaped area. A.C, private pool with chairs/lounges, porch with rocking chairs, patio w/table/chairs, landscaped and maintained grounds with uplighting, pool service, 40' HD television, ceiling fans throughout, WiFi, 4 Cable T.V. 's, DVD, fully appointed kitchen, linens & towels provided, Bedding: King bed in Master, King bed in second bedroom, third bedroom has combination of a Queen bed and daybed trundle (makes into 2 singles) (room sleeps 4), and a Queen sleeper sofa in the living room. The house is 2 short blocks to the most gorgeous beach and Gulf ( 5 minute walk or 1 minute drive by car!) Pool heating is optional from October 1st - April 30th for a fee. All rentals are from Saturday to Saturday. Check-in is 3:00 PM Central time and check-out is at 9:00 AM Central time unless agreed to prior to your stay. This is non-smoking property. Smoking permitted outside only. Security deposit required. Cancellation Policy: 60 days prior to arrival for a full refund.